Example: Armchair Travel captured 150 panoramas and two kilometers of "walking travel" aboard the type 42 destroyer HMS Exeter in five days. 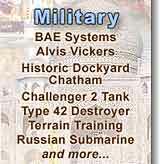 All this material was captured during training exercises, with minimal impact on Royal Navy activities. Example: Over fifty panoramas and one kilometer of travel in St Pau'ls Cathedral were captured in three nights; two nights for the main floor and one night to film the crypt. 2,000 chairs were removed, the floor was cleaned, and over 100 spotlights were installed before filming. After capture, the filmed material is digitised and converted into a Virtual Travel database. Panoramas and travel segments are linked, and "hotspot" areas are marked over the various items of interest in each panorama. This organised collection of imagery becomes the "skeleton" of the project. This skeleton may be easily extended or updated at any time, without re-filming the entire site. After completion of the Virtual Travel environment, each defined hotspot is provided with a name and an interactive presentation. This presentation may take the form of a mini-movie, a slide show, a text description, or a map, diagram or other graphical display. Hotspots and/or mini-movie presentations may be added easily and at any time. Most clients wish to start with an initial set of hotspots and presentations, and then include additional presentations over a longer period of time. The end result is a dramatically realistic environment, captured at much lower cost than Computer Generated Imagery solutions, and presented with far more fidelity. Presentations are easily added, changed or removed at any time. Armchair Travel have completed a number of interactive product brochures, recruitment presentations, engineering tools, safety training systems, etc, for a wide variety of customers including the Royal Navy, BAE Systems, Alvis Vickers, the Army (UK), Marconi LANS, Marconi Radar, British Petrolem, Broadsystem, Statoil, Reuters, DSC, the BBC, Admiral Training, Xerox, Bertelsmann, Hasbro, Waddingtons, and others. If you have a photographic VRproject which has grown too big, or too complex, we can offer assistance and advice to enable you to achieve the very highest quality result, or the best performance to budget. We also offer project design assistance, even if you perform your own panoramic VR filming and / or programming. Armchair Travel offer VR panoramic capture and processing services to client specifications. With over 1,000,000 frames of Virtual Travel recorded to date, no one can offer better or higher quality Photographic VR services than Armchair Travel. Our experience extends from filming panoramas inside photocopiers, to telephoto panoramas on the expanse of the Salisbury plain, from the bowels of Russian Submarine Foxtrot U475 to the top of Victoria Tower. Our delivered panoramic VR movies can be tailored for Web Site, CD-ROM, Workstation, or Kiosk delivery. Armchair Travel offer VR object movie (turntable) video capture and processing services to client specifications. From jewelry to marble statues to entire buildings, we can provide fully manipulable object movies in a variety of formats and resolutions. Our delivered VR movies can be tailored for Web Site, CD-ROM, Workstation, or Kiosk delivery. Armchair Travel offer authoring licenses to our proprietary, award-winning Virtual Travel Engine technology. Use of the Virtual Travel engine can reduce project development times, and significantly increase reliability and performance. 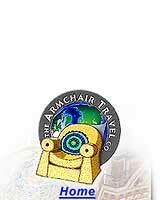 Armchair Travel use our own, award-winning Virtual Travel Engine technology. This technology is the result of over 20 years' experience in producing surrogate travel systems, from the original videodisc-based technology, to today's increasing use of CD- and DVD-ROMs. The suite of technology includes the engine itself, and over twenty different custom-built tools. From the stabilisation of travel segment footage (allowing the use of handheld cameras), to custom hotspot definition, to interactive mini-movie presentation authoring, these tools reduce costs and elapsed time, and improve performance of the final product. Armchair Travel owns a top-of-the-line Seitz panoramic camera. Whereas a 35mm camera could typically capture three panoramic shots on a 36 exposure roll of film, the Seitz typically captures 13 panoramas, thus saving a significant amount of "film-change" time and reducing problems during the capture of the site. In addition, recording each panorama with the Seitz camera is over five times faster than the 12-shot, 35mm photography techniques. The camera also uses 220 format film, and produces panoramic negative images with 200% greater resolution and clarity than most digital or 35mm QuickTime VR techniques. The Seitz capture technology can mitigate very difficult lighting conditions (e.g., a bright window opposite a dark corner), since the Seitz camera can speed up and slow down during its rotation, thereby increasing or decreasing the film exposure as lighting hot- or dark-spots dictate. In addition, the use of negative film in the capture process offers a dynamic range (detail from bright to dark areas) over three times better than for digital camera solutions, thus giving far better performance under typical "available light" conditions. Since the Seitz-captured negative is panoramic to begin with, there is no 35mm "transfer to PhotoCD" expense or elapsed time, no error-prone or time-consuming "image stitching" process, and no "lost vertical field-of-view" due to cropping of 35mm imagery during stitching. Armchair Travel employ a range of personally trained film crews who understand the techniques required to produce the highest quality Virtual Travel and QuickTime VR imagery. Lighting cameramen, grips, gaffers and production assistants are all screened and certified to fulfill Armchair Travel quality requirements. Armchair Travel typically subcontract video interviews to one of four highly professional, proven production companies who can assure the highest quality video, lighting and audio recording. Armchair Travel employ both in-house staff and subcontract, professional (still) photographers to document on-site objects for project mini-movie production. Our historical researchers have produced over 250,000 words of original, scripted narration for the Houses of Parliament project alone. We currently subcontract a range of 5 - 10 professional audio narrators, screened and chosen for consumer, commercial and military project styles. Our own staff are highly experienced in scanning and correcting both positive and negative flat photographic films and transparencies. In addition, on-site captured imagery may be "cut out" and placed onto black backgrounds, etc, for dramatically improved presentation. If you have an enquiry about Armchair Travel skills, services or availability, please contact us.